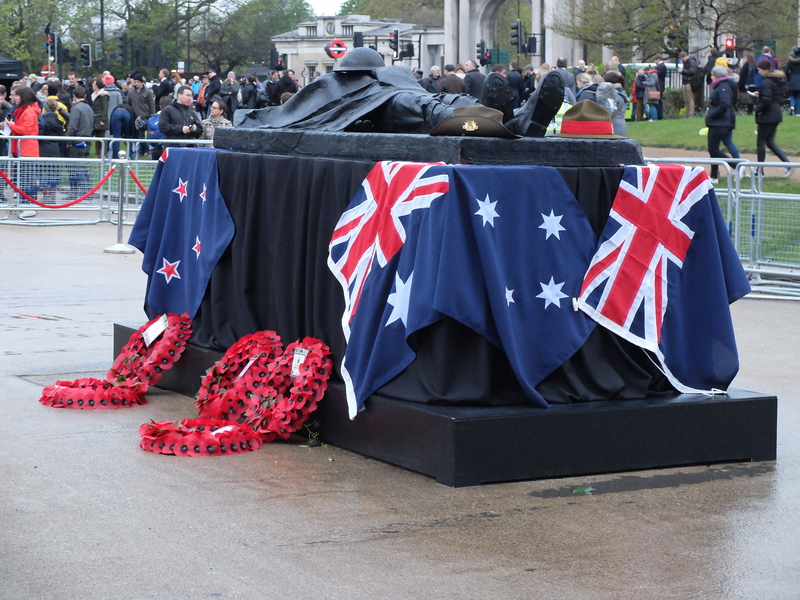 ANZAC DAY, 25 April annually. A public holiday in New Zealand and Australia. The anniversary of the start of the first campaign of the Australian and New Zealand Army Corps in the First World War, at Gallipoli, in the Dardanelles. Massive casualties were sustained. I have a strong lineage. It isn’t aristocratic or regal, but blue collar and enduring. When the British Empire was at its height, my maternal forebears were shipped off to New Zealand, to populate that far corner of the world and build it from scratch. They blew gorges through hillsides and made roads and fought wars to protect it. There was no free pass once out in the colonies. Wherever they were, they continued to fight, as was then their duty, for the Mother Country, England, then still referred to as ‘Home’. As time passed, the settlers’ families continued to support the Empire, though the younger generations may never have seen England for themselves. In one branch of my New Zealand family there were five eligible lads at the time of the First World War. They all volunteered. Two had only just made it back from the Boer War. Those two fought again. 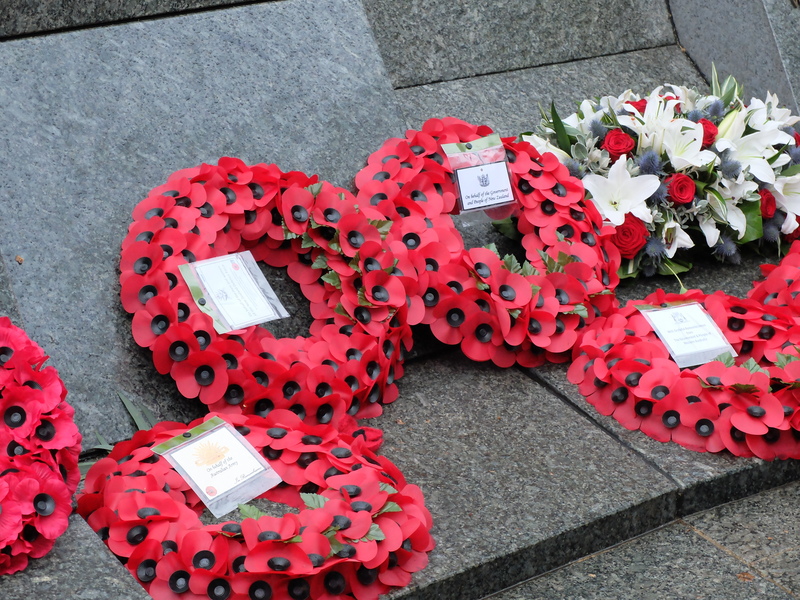 Of the five who went to war, only two made it home to New Zealand. One fell at Gallipoli; the others in France. We have the trench diary of one – a young man’s random thoughts as he faced an uncertain future, surrounded by mud and muck and death. 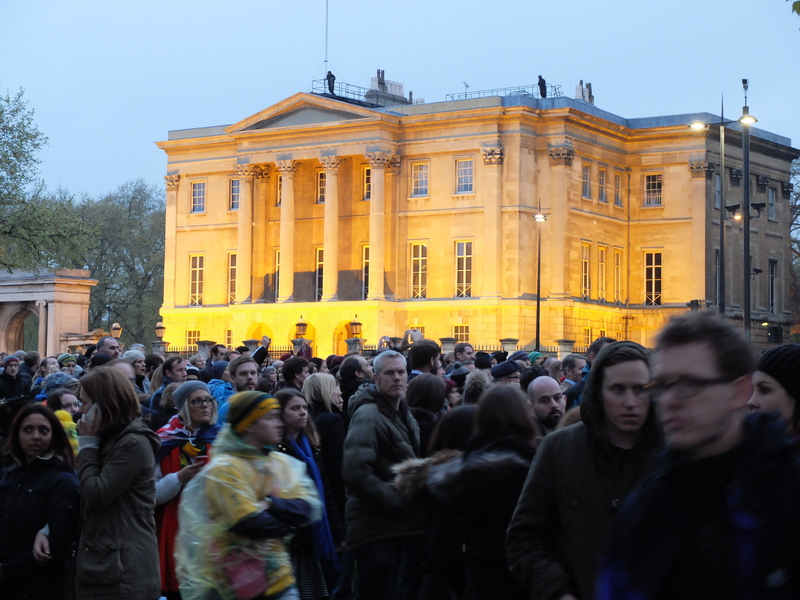 Tragic is a frustratingly small word when describing the loss of youth on the battlefields of the First World War. As one of the survivors said to his mother, my great, great grandmother: ‘Mum, the wrong ones came back.’ He wasn’t referring to good or bad in the trenches; rather the fact that his better brothers had perished whilst the livelier ones, perhaps the ones with a bit more backchat, survived. 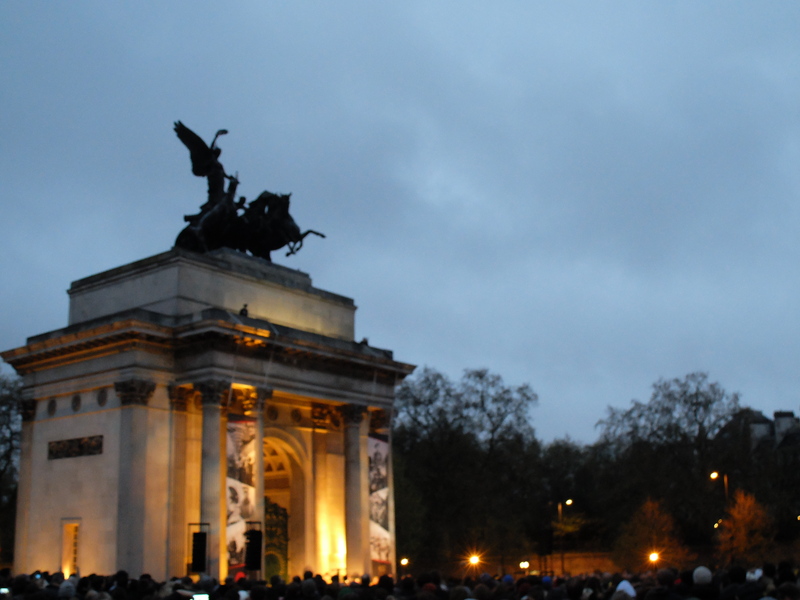 To remember our family’s sacrifice and those of other ANZAC families, both then and since, my brother and I went to the ANZAC dawn parade in London this year, held at the Wellington Arch on Hyde Park Corner. 25 April, 2015 marked a hundred years since our ancestors and many other good, young Australian and New Zealand folk (nurses included) began to perish during that particularly barbaric war. They had bayonets to skewer their rivals. Gases were used, to an unfortunately great effect on both sides. As many crossed the battle line in the attempt to gain ground for their side, it was in the knowledge that they probably would not come back. I have no words for such courage. Only one of the three brothers mentioned here was married before he went to war; the others were too young. Not one of the three had children. One of the brothers had wanted to serve God and become a priest. He got to meet his maker much sooner than anticipated, the irony of which escapes no one in our family. The Australian War Memorial was both sombre and clever. 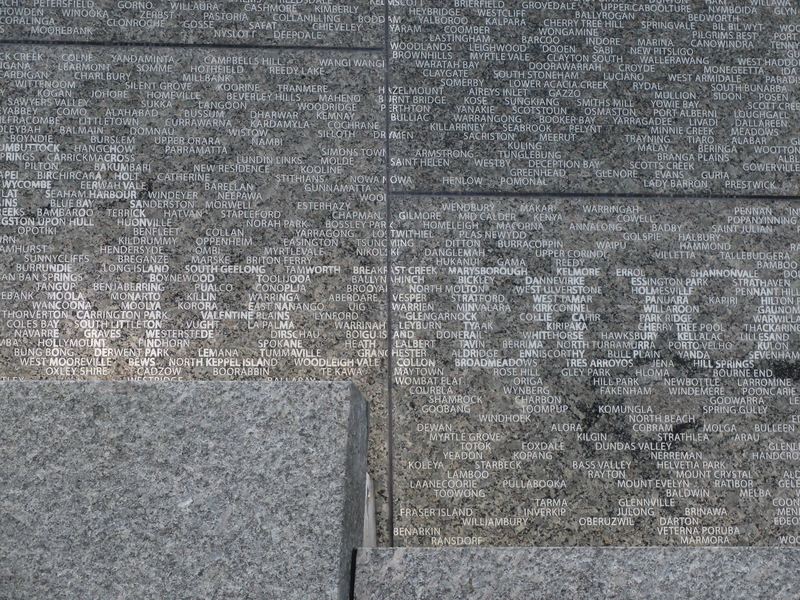 The grey granite wall was covered in place names. 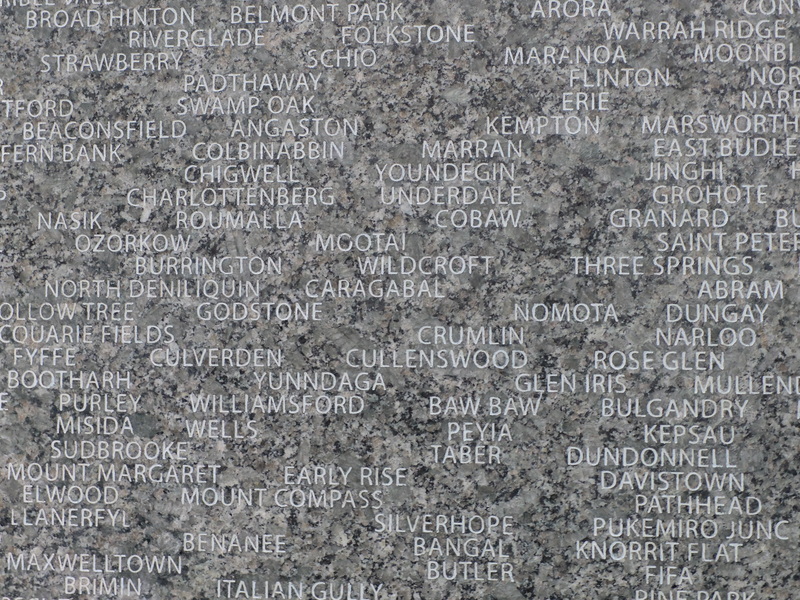 The large names are places around the globe where Australians have fought; the small ones in the background are the Australian hometowns of the military personnel. 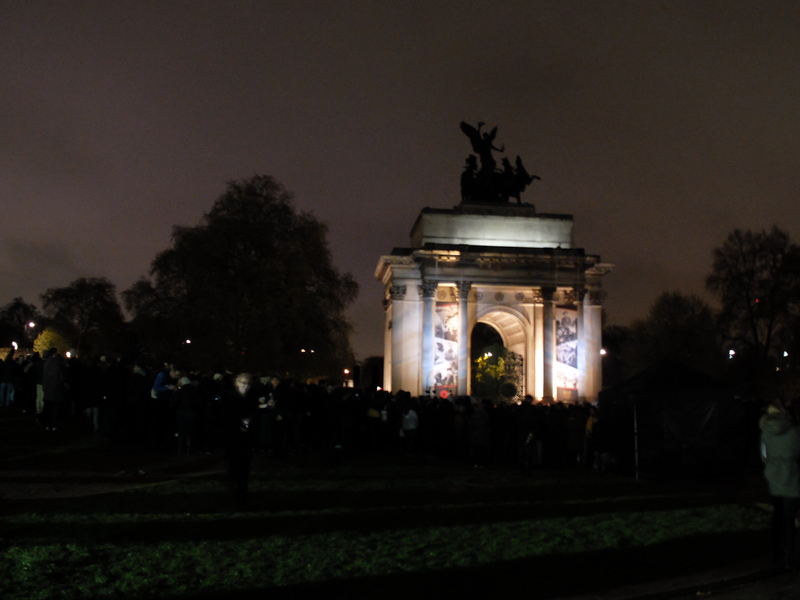 Wreaths laid at the base of the Australian War Memorial (top) and a figure from the Royal Artillery Monument which had been moved for the day to lie directly before the Wellington Arch. 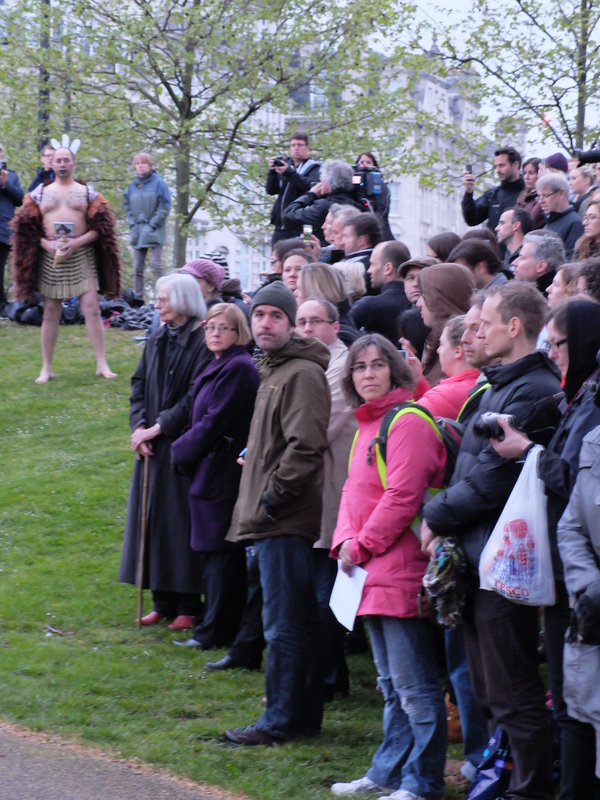 After the ceremony there was a Maori tribute at the New Zealand War Memorial, but we couldn’t see much, apart from this fetching lad in his grass skirt and feather cloak. The soldier above was lovely to speak with. 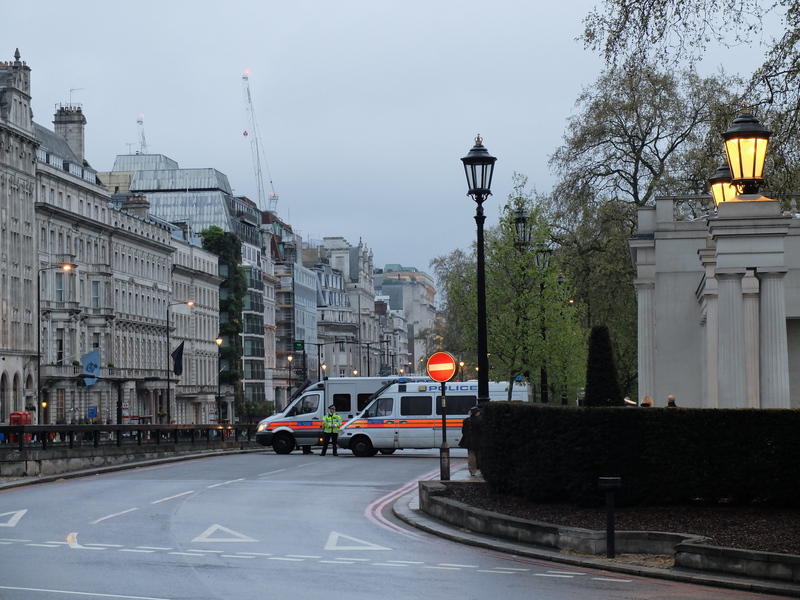 He’s been seconded to a UK regiment and was excited to be in the UK. 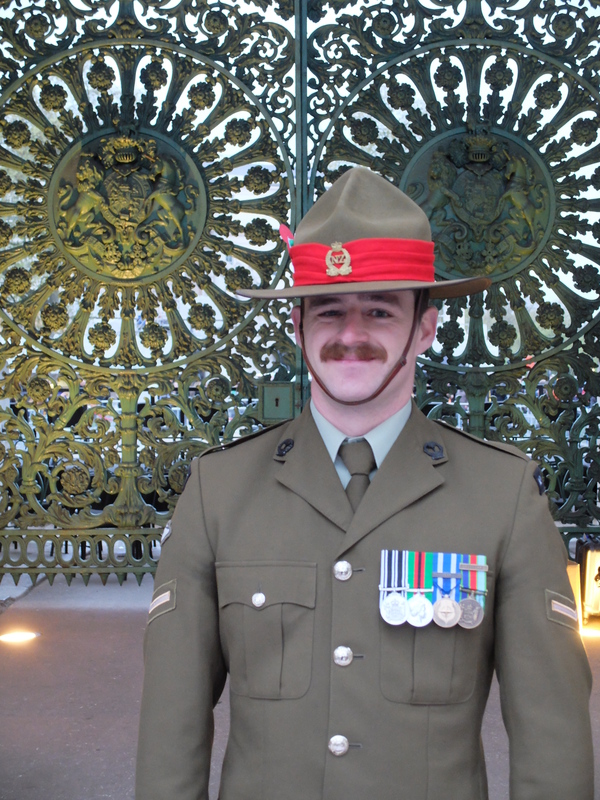 ‘I feel honoured to serve at the ANZAC Day ceremony,’ he told us from beneath his Lemon Squeezer. The Lemon Squeezer is a hat worn by all ranks of the New Zealand Army on formal occasions. It’s been around since 1916. 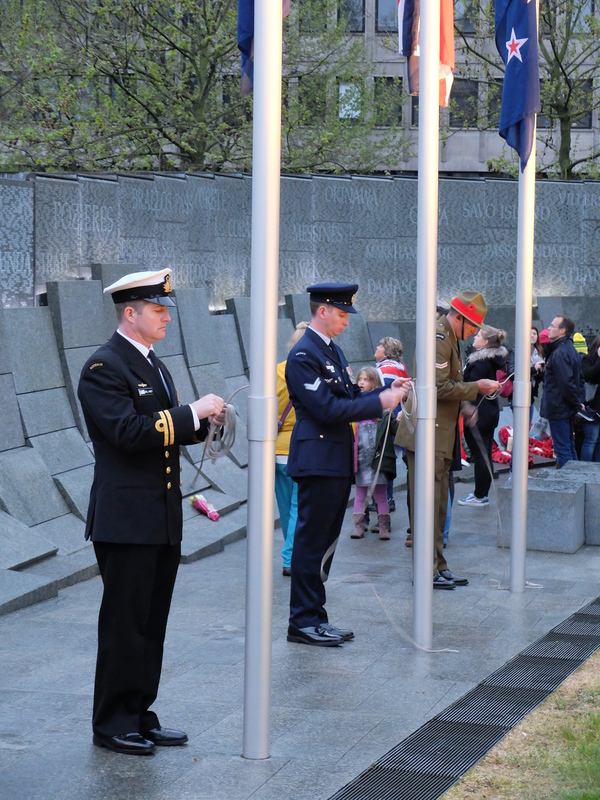 In the middle photo, representatives of the Australian, English and New Zealand military lower their flags to half-mast in honour of the dead. 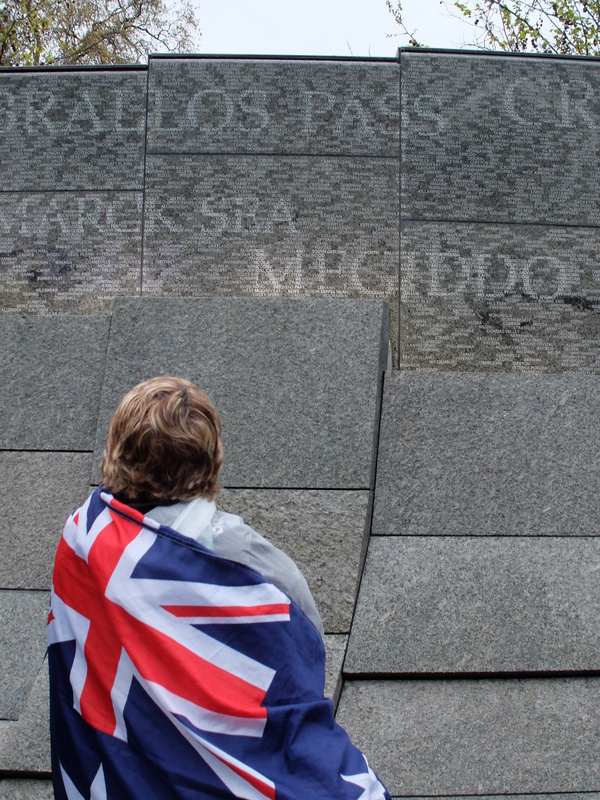 Finally, a moment of quiet reflection before the Australian War Memorial.